The pillow industry has been subject to some drastic changes in the last few years, and now you have the choice of many different fillings to ensure that it suits your individual needs. One type of pillow filling is buckwheat which is gaining popularity all over the world, but unfortunately, with the added choice this can make the buying process more confusing. This guide will show you the best buckwheat pillow and walk you through the pros and cons leaving you to make an informed final decision. The CalmingBreath Buckwheat Pillow moulds to the exact shape of your neck and shoulders by providing strong support. It means your muscles can relax throughout the night as tension is released leaving you pain-free and refreshed in the morning. The pillow has room inside so the buckwheat can be moved around to suit the sleepers needs, this also means that it's suitable for front sleepers, side sleepers and back sleepers. 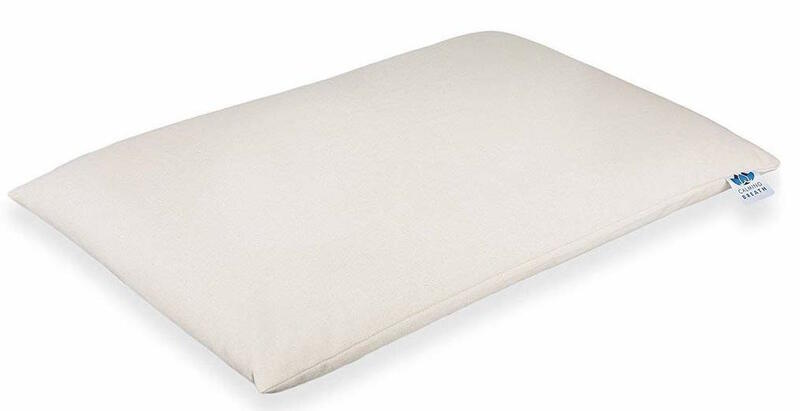 The buckwheat has been triple cleaned, while also being dust free and hypoallergenic so if you do suffer from allergies, then this pillow will not be an issue for you. The buckwheat also regulates the temperature of the user extremely well, staying cool in the summer and warm in the winter. 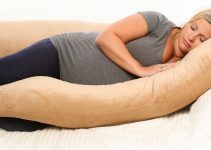 The pillow comes in a thick cotton removable cover which also has a zipper which gives you the option of adding or removing buckwheat to suit your firmness and thickness requirements. This pillow is great if you’re already suffering from neck pain because you can squeeze the pillow into a shape that relieves the pressure, leaving you feeling ache free in the morning. This has been noted by many users who have purchased the pillow with existing muscle and joint pain. Brow farm manufactures their organic buckwheat pillow, and have selected the most premium hulls to go into their product, ensuring that they are firm and intact. The end of the pillow has a zip which allows you to remove and add hulls so you can customise it to your sleeping position. 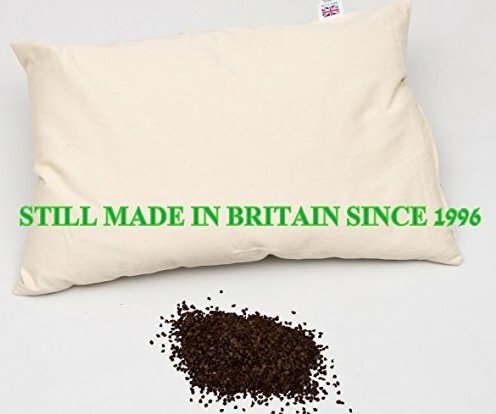 This is also the first buckwheat pillow to be made to UK pillow sizes so is 27 inches in length, which means there are even more Buckwheat husks. These husks have been triple-cleaned to ensure that they are of the highest quality and freshness. A pillow this length is ideal if you want to use your existing pillow covers or want the pillow to cover a larger width across your bed. The firm husks work collectively to support your head and neck cradling it to relieve it of any tension so in the morning you wake up feeling energised. The pillow has a large number of husks which is reflected in its 4.5-kilo weight, while it also has the smell of natural fresh air. The perfect pillow organic buckwheat husk pillow is the equivalent of having multiple pillows in one because you can adjust it to any position or firmness. The buckwheat used is grown without the use of herbicides or pesticides, so it isn’t contaminated like many of its foam and feather competitors. 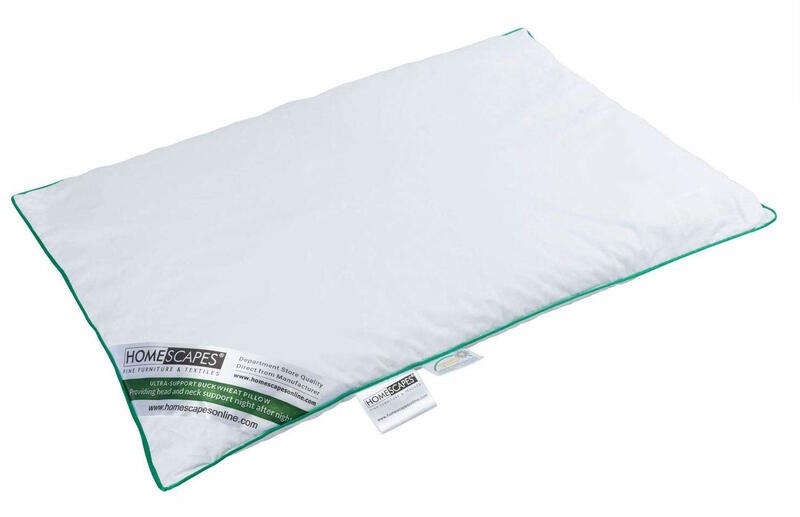 This makes the buckwheat pillow 100% organic and 100% bio-degradable and 100% natural. The pillow is zipped so you can adjust the number of husks that are in the pillow which allows you to change the firmness and height. Also, this will enable you to remove the cover for cleaning. The buckwheat husks are self-temperature regulating which means that during the winter it will keep you warm, and during summer it will keep you cool. Once you begin to use the pillow if you're already suffering from the pain, you will start to see this ease away over a matter of days or weeks. This is due to its cradling and firmly supporting the vulnerable areas of your neck, head and shoulders. Homescapes have established themselves as one of the leaders in the pillow industry by creating high-quality pillows. They have decided to manufacture their Buckwheat pillow due to the growing popularity of the pillow filling. The Buckwheat husks promote air circulation allowing the temperature to be regulated ensuring that the standard benefit of buckwheat is continued keeping you warm in the winter and cool in the summer. The pillow is filled with buckwheat husks which offer a hard surface that also move individually to contour around the shape of your body. This makes it great for those who are looking for strong neck or head support or those already suffering from pain in those areas. The filling is contained with a 100% double cotton case which allows you to manoeuvre the pillow into your desired shape. The case is also machine washable and tumble-drier friendly. Although this doesn’t have dozens of reviews, the ones it has received have been extremely positive especially from those who reported having suffered from severe pain, which has been significantly helped by this pillow. Buckwheat is a plant that creates seeds used in the crop growing industry all over the world. The seeds grow inside hard husks that protect them; these are often referred to as hulls which are then filled into pillows to create buckwheat pillows. Buckwheat pillows are very dense and quite firm, which means they provide a strong level of support, but the individual hulls mean that the pillow can be moulded to create your desired shape. One of the main requirements of a pillow is to provide strong support to ensure that your neck and spine remain aligned while you sleep. If this doesn’t happen, then this can cause pain and stiffness leading to long terms issues. Buckwheat pillows put the neck and head into optimal positioning because they don’t flatten out because of their firmness. The pillow is also adaptable so you can create your custom loft elevation level, so your head and neck are in the most comfortable position. Many people suffer from allergies and with the amount of time you spend sleeping you don’t want these issues to be made worse by your pillow. Even though you can control dust mites on your pillow by regularly washing it, it’s time-consuming and difficult to clean a pillow thoroughly. Plus while it’s drying it will be moist which can attract even more dust mites. The majority of buckwheat pillows are 100% natural which ensures that they are hypoallergenic, so if you suffer from allergies, this will not make your issues worse. When it comes to pillow fillings, it doesn’t get more sustainable than buckwheat pillows. Buckwheat pillows are typically made from 100% plant materials that are all natural and safe when placed in contact with humans. So not only are you improving your health by using it, but also helping the earth by purchasing sustainable products. A large number of pillows available on the market are stuffed full of synthetic materials and chemicals such as memory foam. These chemicals could be toxic in the long terms, but buckwheat pillows don’t contain these toxins because they are all natural and organic. This gives you an even healthier nights rest without the added worry of inhaling dangerous chemicals. Users often positively comment on the fresh smell of buckwheat pillows, especially when compared plastic smell that many other types of pillows smell of when you first buy them. The fresh smell of buckwheat pillow can help leave you relaxed making you fall asleep quicker. Buckwheat pillows are great for travelling. When flying one of the most significant problems is that especially with long flights neck and shoulder problems can start to affect you. The chairs are often cramped which makes it difficult to get into a comfortable position because the seats often don’t have neck support so by the time you reach your destination you’re stressed exhausted and have a stiff neck. By using a buckwheat pillow, this can be avoided. Once you've reached your destination, you can continue using your Buckwheat pillow. When you check into your hotel, you may want to use your pillow because you don’t know if the hotel pillows are packed with bugs or dust mites which can harm you or trigger an allergic reaction. The hulls inside buckwheat pillows move against each other which creates a gentle sound. This can be helpful if you sleep in a noisy environment with lots of background noise that makes it difficult to fall asleep. This rustling noise can work as white noise which can be relaxing, making it easier to fall asleep. One of the most refreshing feelings is flipping over your pillow to the cold side in the middle of the night. This isn’t possible with some types of pillows such as memory foam which often sleep hot. However, buckwheat pillows don’t retain heat. It's because the hulls are shaped like miniature cups which means they can’t be compressed, so this facilitates easy airflow. Buckwheat pillows are ideal for those that consistently suffer from night sweats because you can even refrigerate the pillow so it will be even more refreshing and cool to use. Buckwheat pillows often have a little room inside which means that you can scrunch and mould the pillow into your desired shape, so it’s most comfortable to you. Buckwheat pillows have zippers on the case so you can add or remove fillings to adjust the thickness and firmness. Buckwheat pillows aren't only for bedroom use, but because they are firm and mouldable, but are used in other scenarios. For instance, if you’re working at your desk, it can be used to support your lower back for extra support. Because Buckwheat pillows come in all sizes, you can find one to fit your needs. Buckwheat pillows are firm which means that they offer more support to the neck and head area. This ensures that your head remains upright throughout your sleep which reduces snoring in some users because the airways can be kept clear. Buckwheat hulls can last many years, and it’s usual for them to last ten years. Buckwheat pillows are costlier than feather pillows, but they make up for this in longevity. 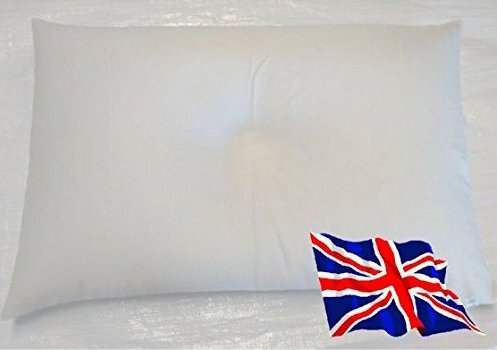 Buckwheat pillows are made with durable fabric to withstand the pressure of the hulls every night, so there are little wear and tear, which shows its overall build quality. It’ll be obvious when the pillow needs replacing because the hulls will begin to flatten and the volume of the pillow will decrease. Buckwheat hulls are lightweight individually, but collectively it makes a buckwheat pillow heavier than its counterparts. This can make it slightly harder to move throughout the night for some people. It’s nothing too strenuous, but it is something to be aware of. Unlike other pillow alternatives, there aren’t dozens of companies that manufacturer buckwheat pillows because they have a longer and more difficult manufacturing process. This narrows down your options significantly; however, this then does make the overall purchasing decision easier because you aren’t overwhelmed with choice. Overall, Buckwheat pillows are very underrated in the industry and are very effective especially if you sleep on your back because this will provide a firm, supportive surface to align your spine. The best buckwheat pillow also works well to regulate your temperature and keep you cool, while also decreasing snoring by keeping your head upright to keep the airways clear.